The low hanging sun punishes my terrified pale skin as I stand on the red soil with my notepad trying to be a journalist, hoping my inexperience isn’t showing. A little girl standing nearby cries inconsolably. I watch as an enraged man, perhaps her father, lashes her in the face mere centimetres from her eyes with a small branch. A hysterical woman, who I suppose must be her mother, runs to her defence. When the man launches himself at the woman (his wife? ), I don’t know whether or not to stop him, or say something, or take a photo, so I just stand there awkwardly, like the outsider I am. I’m not sure what to do, but my Rwandan companion knows exactly what to do. He calmly positions himself between the man and the woman protecting the child in a non-confrontational way. Soon the commotion dies down and the sound of children playing returns. It’s July 2012, in Cyaruzinge, a small village of indigenous Batwa on the outskirts of Kigali, the capital of Rwanda. I’m here doing a two month internship as part of my journalism masters program. The mountainous, densely-populated country of 11 million in East Africa is less than half the size of Nova Scotia. After the 1994 genocide, when almost a million Tutsi and moderate Hutu were killed in a government-sanctioned slaughter, Rwanda was the poorest country in the world. Under Paul Kagame, the country’s current president who led rebel forces to stop the genocide, Rwanda is sometimes called the Singapore of Africa. Levels of corruption are lower than some European Union states, and annual economic growth is at an impressive 8 per cent. I had been fascinated by the Batwa (also known simply as the Twa), who are referred to as pygmies because of their relatively modest stature, ever since I first read about Rwanda’s history before my internship at a small newspaper in Kigali. They became an alluring mystery simply because there was so little information available about them. Like most people who follow the news, almost everything I knew about Rwanda was related to the genocide. What most people don’t know is that as much as one third, or 10,000 people from the tiny Twa population were also wiped out, possibly because they were associated with Tutsi hegemony. The man in Cyaruzinge perfectly conformed to many Rwandan’s stereotypes about Twa primitiveness. He was also completely atypical of the many Twa that I met during my time in Rwanda. Most were dignified, intelligent, and witty. They treated me with respect, and any sense I had of feeling like an outsider came from my own insecurities and frustrations at the brevity of my visit. 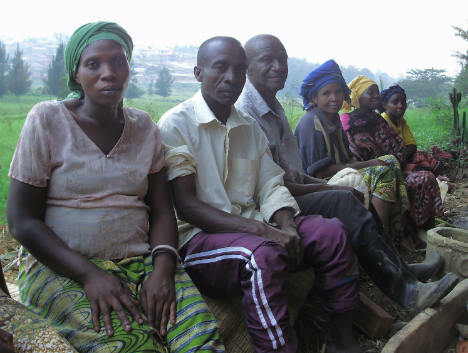 The Twa’s place in Rwandan society has been dictated by many myths. One of them goes like this. Kigwa, son of the god Nkuba (“thunder”) and the first Rwandan king on earth, wanted to see what kind of character his three sons had, so he presented them with a task. He gave each of them a bottle of milk to take care of overnight. Gatwa, father of the Twa, drank all his milk, and Gahutu, first of the Hutu, fell asleep and spilled his. Only Gatutsi’s remained intact in the morning. Thereafter, the Tutsi became the elite cattle-herding class. The Hutu became peasant farmers, and the Twa were relegated to the forests. Anthropologists tell a different story. The Twa’s ancestors were the first inhabitants of Rwanda tens of thousands of years ago, and used to make their living in the country’s lush forests as hunter-gatherers. Several hundreds of years ago, the Hutu and Tutsi arrived, and began to develop more and more of the land. The Hutu served as farmers and the Tutsi as cattle-owners. By the seventeenth century, a Tutsi-dominated monarchy had developed. Despite their position on the bottom rung of society, the Twa served a special function to the Mwami, or king. Besides supplying important symbols of monarchical power from the forest such as leopard skins and ivory, they served as the voice of the people, advising the Mwami of what his subjects were saying. The king’s power was rooted in his ability “to bless and to curse,” and the Twa helped him in this role. They were also seen as playing an important role over fertility of the land. “In pre-colonial Rwanda, if your field was not producing well, you would cut the finger off a Twa and plant it in your field, and that would help it become fertile,” Lewis says. Post-independence Rwandan governments evicted thousands of the Twa from their forest homes during the 1970 and 1980s for conservation and commercial projects, and gave little or no compensation. “The Batwa were just basically kicked out and told, you know, go and sort yourselves out. This was very costly to them in terms of suffering and death,” Dr. Lewis told me. This loss of their traditional land and source of livelihood plunged the Twa into destitution, and this is where they remain today. Zephyrin Kalimba is the director and founder of the Community of Potters of Rwanda (COPORWA), which promotes Batwa rights and supports them with development projects and training. I meet him one day in COPORWA’s offices in a self-contained compound in Gikondo, a poor neighbourhood in the south of Kigali. Kalimba, himself a Mutwa (singular of Batwa), doesn’t conform to most Rwandans’ stereotype of the uneducated, primitive Twa. He is a serious man, dressed in a dark suit despite the heat. He speaks passable English and good French. He is of short stature, though perhaps not as short as one may expect of a “pygmy”. 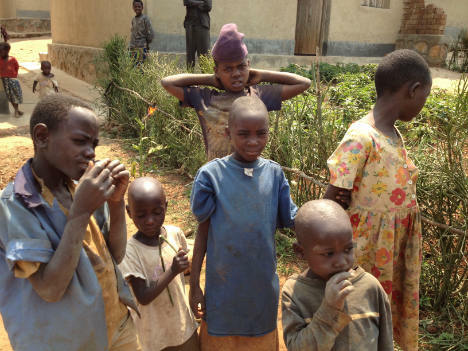 The Twa, who number about 35,000 in Rwanda (less than one per cent of the population), live under dire conditions. A COPORWA report published in 2009 called the Twa “the most vulnerable and poor group in the country.” According to a survey found in the report, 77 per cent of the Twa are illiterate (compared to 33 per cent for the general population), 51 per cent have never attended school, 47 per cent have no farmland (four times the national average), and 30 per cent are unemployed (less then two per cent nationally). Since the genocide, the Kagame government has downplayed ethnicity. Encouraging ethnic animosity or solidarity is illegal and public references to ethnicity are taboo. All references to ethnic origin have been stricken from official documents. Surveys have shown that most Rwandans believe making reference to ethnicity is illegal, though there’s no law explicitly stating this. The government maintains that all Rwandans have the same language, history, and culture, and therefore there is only one ethnic group – the Banyarwanda. However, under international law, governments don’t have the right to identify who does and doesn’t belong to a distinct ethnic group. Individuals have the right to identify themselves with whichever group they choose. Getting the government to comment on this issue is very difficult. Officials are tightly controlled, and ethnicity is a touchy subject. Sometimes they don’t return calls, and sometimes they insist that they’re not qualified to talk about the subject. The government does offer programs for Rwanda’s most vulnerable people, a category under which virtually all of the Twa find themselves. For example, the Vision Umurenge Programme (VUP) aims to protect vulnerable groups and eliminate extreme poverty by 2020. The village of Cyaruzinge was actually built by the government in conjunction with the charity group Health Development Initiative Rwanda in November 2011. The government contributed the stones, gravel, and cement, as well as 15 cows. Before that the land was undeveloped fields and forest. However, the cows died because they didn’t have enough grass to eat. The National Social Protection Strategy aims to give special support to vulnerable groups, going so far as to offer “positive discrimination in terms of access to benefits from public services” for the Twa. Their university education is paid for by the government. Only a few Twa make it that far though, and only about half make it through high school. Most western governments wouldn’t get away with refusing to recognize the unique identity of an indigenous group. However, Rwanda presents a unique case. During the genocide, an event that still hovers over the country like a dark cloud, ethnicity was used as the impetus for murder. The Hutu were encouraged to slaughter the “cockroaches” merely because their identity cards said Tutsi. “We appreciate that Rwanda has a very tragic, very unique history which makes the issue of ethnicity one that’s very difficult to discuss,” Claire Thomas tells me from London, England over a shaky Skype connection. She’s a deputy director at Minority Rights Group International who’s worked with the Twa in Rwanda before. Lewis appreciates Rwanda’s unique historical context, but worries about the effects of this policy. “It’s clearly inappropriate in Rwanda or anywhere else for politics to be influenced by ethnicity, and that sort of a ban of ethnic affiliations being explicit in politics is very sensible. However, once you move out of the political arena I think it’s destructive for a healthy, sustainable society.” He says policies of assimilation have proven to be very harmful in places like Canada and Australia. The Kagame government and Rwandans in general have been skeptical of recommendations from outsiders since the genocide, a calamity during which the international community effectively “stood around with its hands in its pockets,” as Kagame once put it. Most Twa that I meet actually seem to be more concerned with their material well-being than cultural preservation. 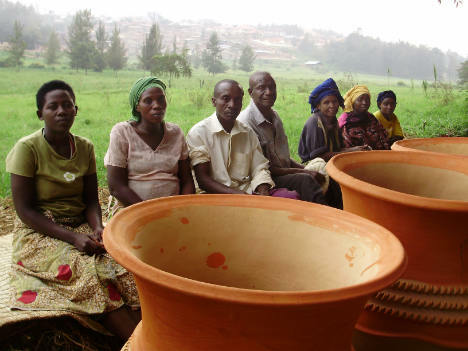 One day in June I go with Rwandan colleagues to the Twa Abakomezamwuga cooperative that sells pottery alongside a road in Kigali’s Kacyiru district, not too far from the large American embassy. There are seven men and thirteen women in the coop. We sit together surrounded by hundreds of light brown clay pots of various shapes and sizes, some as tall as a small child. The Twa workers wear brightly coloured clothing and are a gregarious bunch. One them, Claude Mayira, jokes that women are the leaders of their households. “They rule us!” he says, and everyone laughs. Chantal Mukaruhanga is the head of the coop. She has a serious demeanor and seems to command a lot of respect from the others. She says she’s not ashamed of being a Mutwa, but stresses that they’re all Rwandan. Mukaruhanga says because they never went to school, all they can do is make pottery. She says conditions have much improved under Kagame, and she’s proud her son is now in the fourth grade. They say their biggest problem is that they have no land. “We need to own land like anyone else,” says Mukaruhanga. They’re currently renting land for the coop from the Red Cross. Kalimba confirms this problem during our discussion at COPORWA. “If you have no land, you have no life,” he tells me. A 2004 survey found that 43 per cent of Batwa households were landless, compared to only 12 per cent for the general population. With one of the highest population densities in Africa, tiny Rwanda has little land to spare. Perhaps due to their impoverished condition, the Twa have been the victims of prejudice, particularly in rural areas. “A parent might say, ‘Why have you come in looking as dirty as a Batwa’ to their child,” Thomas says. She points out that until very recently, jokes portraying the Twa as stupid were even aired on Rwandan state radio. At the coop, Mayira tells me discrimination was a big problem in the past. “They used to distance themselves from us. We couldn’t sit at the same table as other Rwandans and eat with them, but there was enough food for us.” Even random attacks were fairly common. However, they’re all eager to point out that under the Kagame regime, this has changed. “Today, no one abuses you because you’re Mutwa,” Mukaruhanga insists. Fearing that they’re succumbing to the common tendency to lavish blanket praise on the regime, I tell them we’re not from the government and they’re free to speak their minds, but they insist it’s the truth. Rwanda’s 2003 constitution strictly forbids any form of discrimination, though a fear of referring to ethnicity may prevent people from lodging official complaints with the government. Claude Bizimana, my Rwandan tour guide in the village Cyaruzinge, works closely with the Twa. He is as dedicated to and respectful of them as anyone I’ve met, and insists that discrimination is a thing of the past. He says they even play soccer and have drinks with other Rwandans. Some of my Rwandan colleagues giggled when they saw my pictures of the Twa, but when they met them at the coop they were friendly and treated them with respect. When I was in Rwanda last summer, there was one Twa senator, Juvenal Sebishwi, but Kalimba wasn’t too fond of him. “He doesn’t defend the rights of the Batwa,” he said. Perhaps someone was listening to Kalimba, because he was appointed a senator after I left Rwanda, in October 2012. Maybe now he’ll be in a better position to advocate for his invisible people.